Most companies today, whether large or small, product/manufacturing or services-based, herald their workforce as their most valuable resource. Companies in vertical industries with a high concentration of knowledge workers sound this sentiment even more strongly. But there is little evidence that those companies employ technology and software tools commensurate with the stated importance of their workforces. Instead, these companies are using basic task tracking software, or worse, spreadsheets, sticky notes and emails to track their workforce. 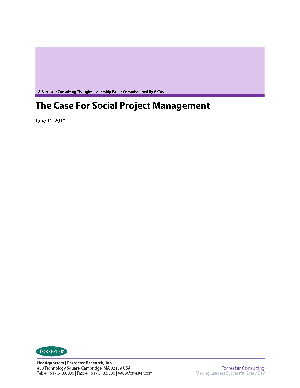 In February 2010, AtTask commissioned Forrester Consulting to evaluate the benefits of incorporating social networking-like peer collaboration processes into project portfolio management (PPM) software and methodology. Then, to further explore this trend, Forrester developed a hypothesis that tested the assertion that knowledge-worker-centric organizations are good candidates for social project management. In conducting an in-depth survey with 150 knowledge workers and managers, Forrester found that these companies strongly identified with the potential value and benefits that could be derived from infusing social networking techniques - involving self-governance, peer collaboration, and qualitative work activity information capture - into task and project management.